For survival, every culture develops methods of curing food to prevent deterioration. From the bounty supplied by the Chesapeake Bay and eastern woodlands, the Virginia Indians smoked and stored game and fish for the winter months. Fish was smoked where it was caught and transported back to villages while venison, bear and other game hung in the tops of houses so that smoke from the fires preserved the meat. 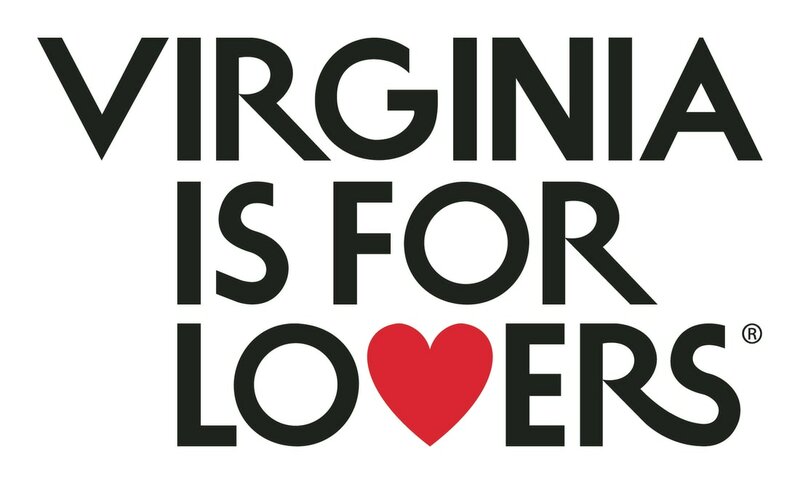 These techniques were observed by some of the first English settlers to arrive in Virginia. Swine, brought to the New World by Europeans, flourished in North America. Practically the perfect colonist, pigs are a relatively easy animal to raise, and they became a staple for most farmers by the 17th century. For the colonists, however, ham was the perfect food for export. In the New World, counties and towns grew as a result of the trade and commerce that sailed to and from its shores. Wharves and warehouses were built, and vessels sailed to and from foreign and domestic ports bringing with them news and various imports such as sugar, spices, chocolate, coffee, tea and liquor. Merchants, who maintained close ties with other seaports, sold these items in their stores and helped facilitate the export of goods such as tobacco, tar, pitch, turpentine, wood, shingles and, of course, ham. This trading system fueled the New World’s economic engine. Throughout the years, the business of ham became quite large. Industrial smokehouses replaced smaller farm and business fixtures, and numerous companies – some with names still recognizable today - gave their names to ham. 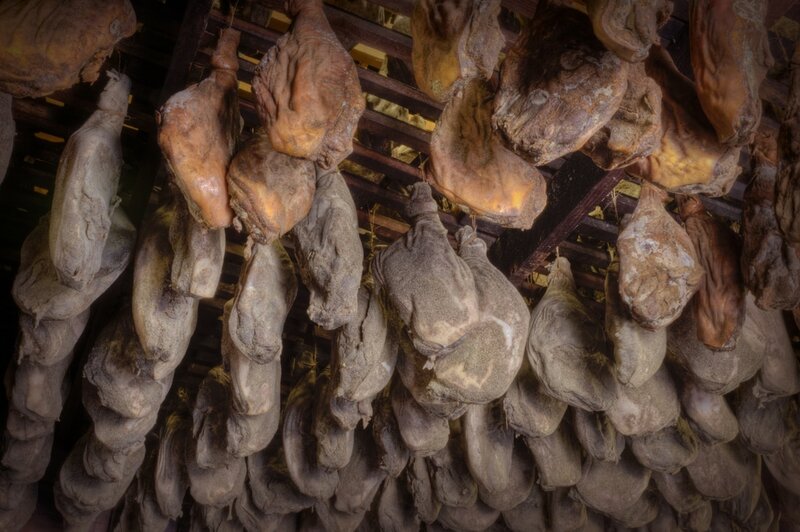 Today along the Salty Southern Route, we can see and taste the influence of this history in salt and hardwood-smoked dry-cured hams, which keep indefinitely and without refrigeration. Located in Surry County, Edwards Virginia Smokehouse was founded in 1926 by S. Wallace Edwards, Sr. in response to the demand for dry-cured ham sandwiches from hungry passengers crossing the James River on the Jamestown-Scotland Ferry. The method for curing hams was passed down from generation to generation in the Edwards family, and is reported to have been taught to the early English colonists by the indigenous people living in the region. 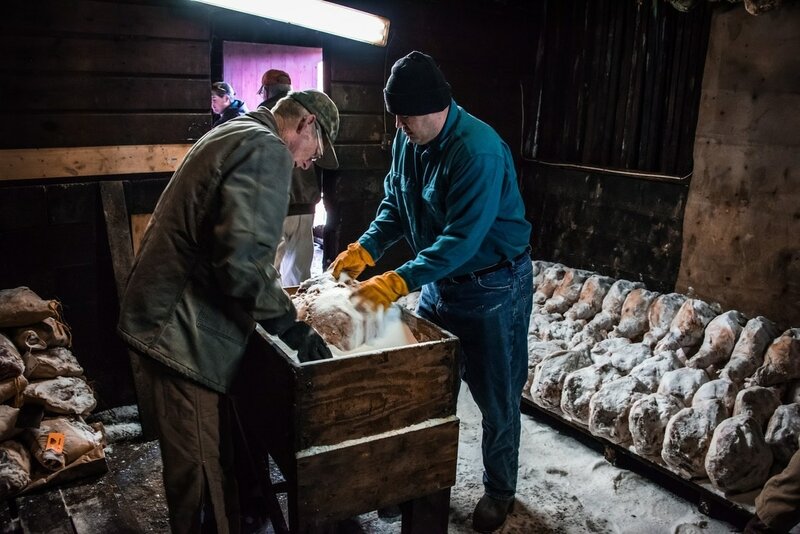 Edwards’ curing process involves the simulation of seasonal weather changes, combining science and skills needed to produce their world-famous smoked meats. The company continues to be family owned and operated 90 years later, with the same care and attention given to the production of all their delicious meat products. While curing, a ham’s geographic location and the local bacteria generate different flavors within the product. Cured and smoked hams do not require refrigeration until after cooking. 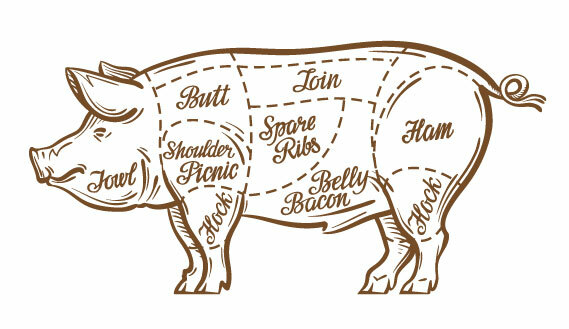 The ham comes from the rear leg of the hog. Ham is one of the oldest preserved meats in the world. Ham sandwiches are the most popular in the US. FEMA ( the Federal Emergency Management Agency) keeps a reserve of 3.6 lbs of canned ham for every American. ​The curing process begins in January when the hams are delivered, each weighing in at about 18-25 pounds. The hams are rolled in plain old table salt, rubbing and coating them until the entire ham is evenly covered. Salt draws the water from the ham and reduces the weight of the hams by approximately 20%. The Darden’s then get help from neighbors, friends and family to lay the hams carefully on pallets. The position of the ham on the pallet determines the shape. A perfect ham is shapely, not too round, not too flat. Country bacon comes from cured side meat. These pieces have twine attached for hanging after the seasoning. “Gotta get that twine just right to keep the ham from slipping from the rafters. The most labor intensive part of the ham business is the washing the hams and then pepper coating them. They’re scrubbed in hot water and all the salt is washed off. It's a messy operation. Side meat that is going to become bacon is covered in black pepper and then hung to age. After the salt is washed off, Tommy ties a loop of string to the end of the ham hock so that it can be hung from the rafters. The hams are then carefully hung in the rafters and allowed to cure for about 40 days and nights. Next, the hams are smoked with hickory and apple wood during the rainy days of April and May. After the smoking, the hams age to perfection. "We don't like to slice, sell or cook any hams until after July 4th." says Tommy. The Darden’s sell slices of ham thought out the year at their store, but hams can be reserved for the holidays. Click here for Dee Dee and Tommy’s instructions on how to cook a country ham. More information on the pork industry in Virginia can be found on the Virginia Pork Council website.